Feeling nostalgic as we head into marathon weekend again. It was just shy of one year ago, when Paul and I announced that we were expecting. 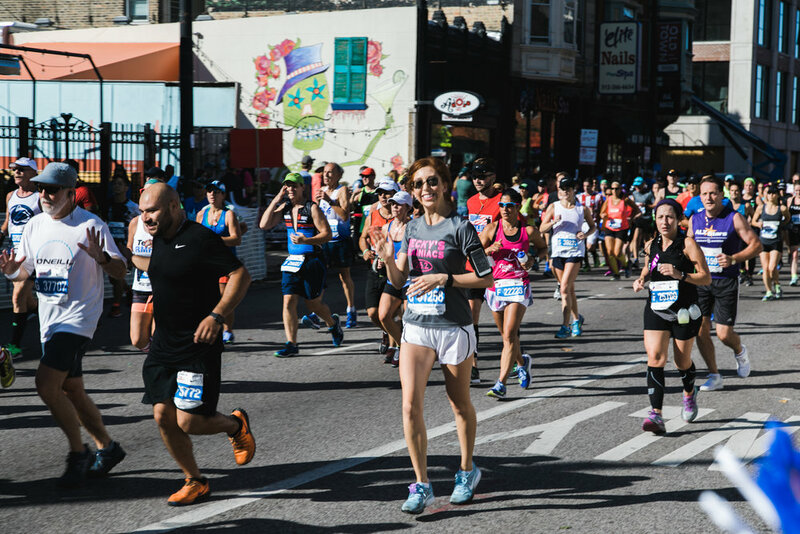 This announcement, while somewhat delayed, was a very conscious decision, as I’d be running the 2017 Chicago Marathon while nearly 5months pregnant, and frankly, I was afraid of judgement. I can’t tell you how many people told me not to run, but I also can’t express how incredible that run felt! It was my best first half and while I slowed my pace for the second half, I felt better after this race than any race prior! 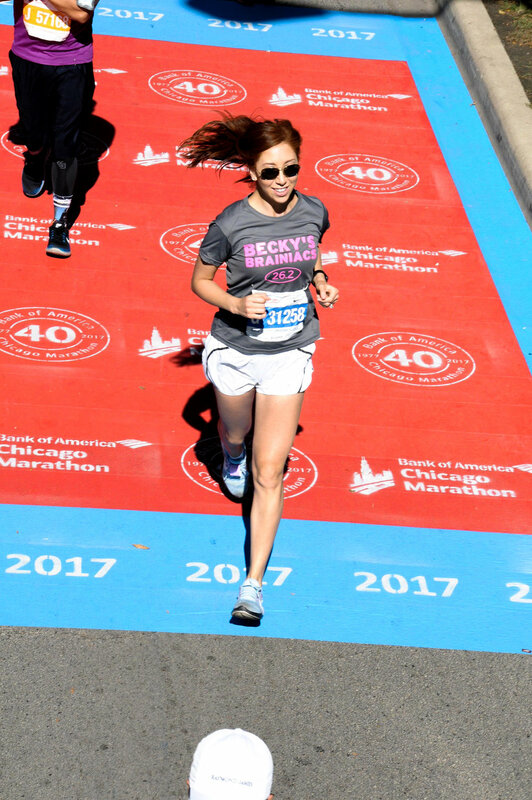 Running the 2017 Chicago Marathon was by far one of the most empowering experiences of my life! It was teamwork through and through– I’ve always said, this was as much baby’s marathon as it was my own & I stand by that statement! I was already registered and training when I learned I was pregnant, and while I knew this little bundle would add some difficulties to the process, running was never in question. In fact, from the moment I learned I was pregnant, I’d gotten excited about the idea of baby’s first marathon! Like any mom, it was important to me that baby get the best start possible in life, and to me this translated as completing this race for him. I loved the idea of baby having completed his first marathon before being born, and I wanted this to serve as testament that he was fully capable of accomplishing anything he wanted in life! I realize it sounds cliche– maybe even superficial to some, but this race was symbolic of so much more than 26.2miles, this was my way of offering babe a “go get ‘em” outlook for life– a springboard for his future! Like I said, running while pregnant was never in question, but the logistics were a day by day reassessment. I still remember our first doctor’s visit. We’d just seen babe for the first time via ultrasound and were giddy with excitement and still somewhat in shock. We’d just stepped into my new doctor’s office and while I don’t remember exactly how the subject came up, I remember saying the word “marathon”, and immediately receiving a firm “No”. In fact, I was strongly advised not to run more than 10miles on any given day. I want to be clear that this had nothing to do with my pregnancy, we were not a high risk case, had no complications, and everything was going smoothly, nevertheless, this was the general and immediate recommendation. Keep in mind this was our first introduction with this doctor, so first impressions were officially not going well. I don’t like being told “NO” whether I’m pregnant or not, so as you can imagine, I sought second opinions… turns out, everyone and their mother agreed. I was incredibly frustrated, but like any well intended mother, I wanted what was best for my baby, I wanted to put his safety first, and if that meant not running a marathon, then that’s what needed to happen! Therefore (though reluctantly), I obliged and quit training. Two months went by, and daily I questioned whether I could complete the distance. I was still running a leisurely 4-6miles, and averaging 5-7 miles in walking. That was 10-13miles a day right there! I couldn’t shake the idea of doubling that, and ultimately I knew in my gut that completing a marathon safely was well within my reach! Disclaimer: there are so many reasons why you should not try this at home, and my doctor (and all others) weren’t wrong to tell me “no”. A marathon is no small feat for anyone– pregnancy excluded, but ultimately, no-one knows my body better than me. This was my area of expertise– both as a runner and fitness professional. 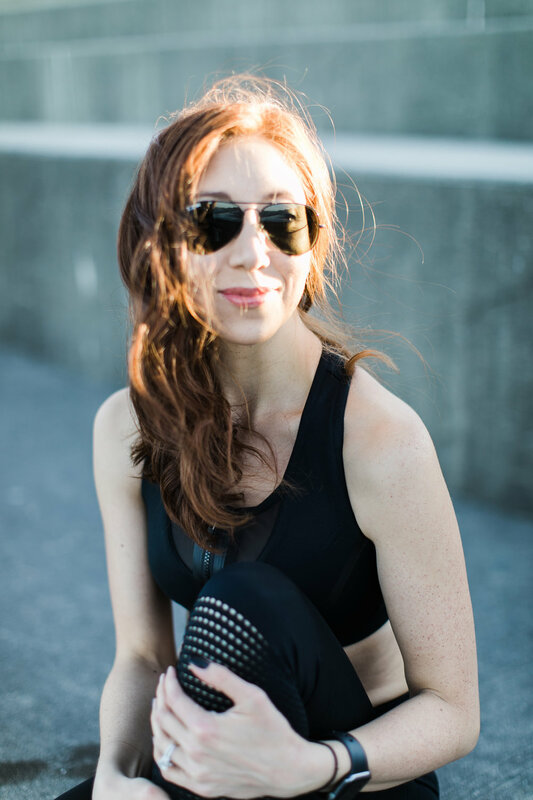 Not only am I regularly engaged in physical activity, and trained in the risks and precautions of pre/postnatal care, but as a fitness expert, I am highly in tune with my body. So, after two months of holding back in my runs, I was back in training mode. Again, the logistics of marathon training while pregnant were a daily reassessment. 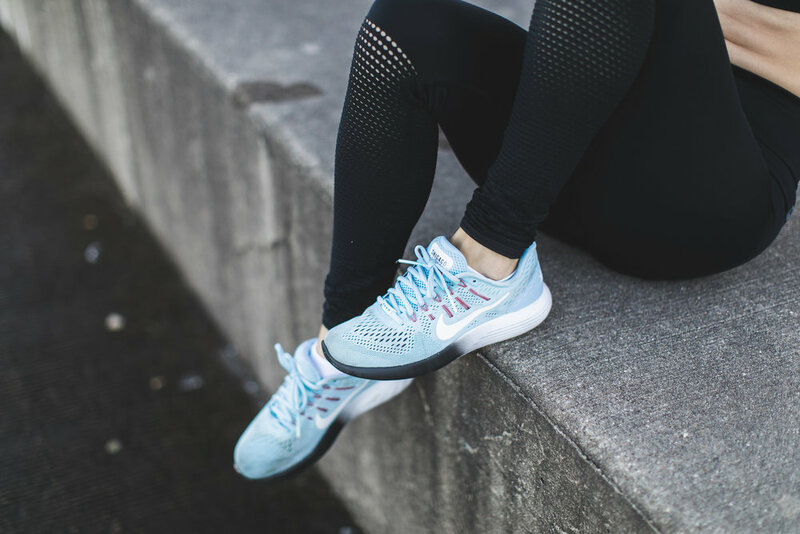 While I was lucky to experience a fairly easy pregnancy, my most prevalent symptom was fatigue, which made sticking to any training schedule daunting. Every week felt different, the side effects of pregnancy were unpredictable (especially for a first time mom), and my body was physically changing as it developed and made room for a whole new little person. The entire process still fascinates me, and the fact that our bodies can continue to perform under these circumstances is incredible, but that’s a whole other soapbox for another time. I forgot to mention, nothing was fully decided until game day. I cannot emphasize how carefully we went about this. Training was extremely casual compared to years prior & fully dependent on how I felt each day. I remember constantly feeling bad as my pace would slow or I would fail to cover our set distance for that day, but Paul was extremely supportive and trusting of my judgement at all times. That being said, we did decide that he had veto power. Come race day, if for whatever reason he didn’t feel comfortable with me putting myself and our baby through the stresses of race day, he could ultimately say no. If I’m completely honest, every day of pregnancy is so different, that I didn’t even fully know my commitment until race day– had it been raining or the forecast predicted higher temperatures, I would have probably backed out, but as it stood, the conditions were prime for a safe and enjoyable race! On race day it wasn’t about pace or finish time, I was so intentional about listening to my body and baby that I decided to run alone, didn’t listen to any music, and was constantly meditating, praying, or mentally chatting with baby. I also refrained from any supplements. Whereas I would typically partake of energy gummies/gels, I was already so particular about my prenatal nutrition that I decided to stick to natural options such as bananas and orange slices offered later in the race, though I was incredibly grateful for the woman at mile 12 handing out Sour Patch Kids & Sweedish Fish– who knew those could be such an amazing race day treats! Like I said, it was my best first half marathon ever– though I pushed myself a bit more in order to avoid that afternoon heat. Being that extreme heat is a major health risk during prenatal exercise, I wanted to get as many miles in as I could before full afternoon sun exposure hit. Honestly, the whole race was a runner’s high! When you’re pregnant, there are many risks to look out for, but your body is also operating at a higher capacity with added red blood cells and oxygen pumping through your system. I want to be very clear, that I am not a medical professional and highly advise seeking medical clearance before engaging in any physical activity while pregnant, but in my experience, I never felt any shortness of breath, joint pain, or signs of overheating. Aside from some sciatic pain during part of my training, nothing ever felt abnormal. Would I do it again?… I can’t tell you how many times people have asked this, but truthfully, there’s no way to tell! I firmly believe that each women and pregnancy is unique, so I would need to re-evaulate the situation entirely. I can’t emphasize enough how carefully we made this decision. Running while pregnant is tough and messy (I had to resort to short treadmill runs in my third trimester, purely out of bladder control), but it is possible when executed carefully. Again, it’s my job to train clients safely and effectively towards their goals, this is my area of expertise, and I am highly in tune with my body. No one knows my body better than me, and I knew from day one that this was a task I could complete, but I still stand firm– crossing that finish line was as much baby’s victory as it was mine, and perhaps it’s that teamwork from those early stages of our relationship that made the experience that much more rewarding! Maintaining a training routine while traveling can be challenging. Throw in holiday parties, good food, and lack of gym equipment, and you can feel at a total loss. When training, I advise all clients to invest in two items... a foam roller & mini-band. While I'm big on training glutes & core (see workout here), in general, I like to target all major muscle groups within any one workout. Below are some of my favorite mini-band exercises you can do anywhere (I actually keep a mini-band or two in my purse). It's quick, it's simple, but it gets the job done! Loop band around both legs and bring it above the knees (no pressure on knee joint). Feet hip width apart, hinge from the hip, keeping weight in the heels. Take one step out to the side to widen stance while maintaining hinge. Return to neutral stance (hip width apart), and repeat. Practice 15-20 reps on each side, then return to center for 20 pull aparts. Your glutes should be on fire! Begin in plank position, shoulders above the hands, and feet hip width apart– band around the ankles. Carefully lower to forearm plank, and return to full arm extension. ProTip: focus on maintaining stability in your hips. As arms lower hips should follow, but they should remain parallel to the ground at all times. Repeat for 10-20 reps. In a soft stance (knees slightly bent), grip band with both hands & raise arms to shoulder hight. Keeping arms parallel to the ground and shoulders down away from the ears, pull band apart and in towards chest. Extend to straight arms and repeat for 15 reps. If you're doing this right, you should feel it in your back with each pull. Begin by lying down, band above the knees, and knees bent at hip width apart. Pulling thighs apart, so as to break that band, press through the heels & squeeze glutes to raise and lower the hips. Repeat 15-20 times. 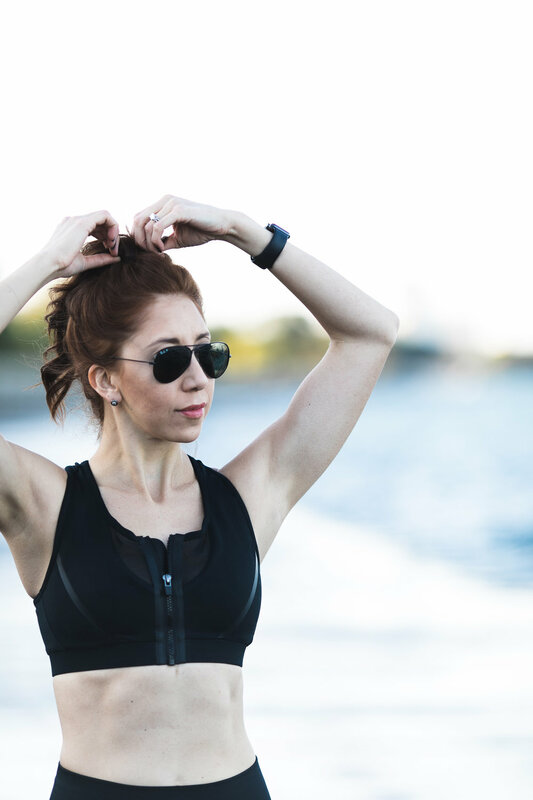 Whether it's your first marathon or you're just dabbling in the idea of running for your own fitness, I'm sharing 10 marathon week training tips to guide you to the finish line! 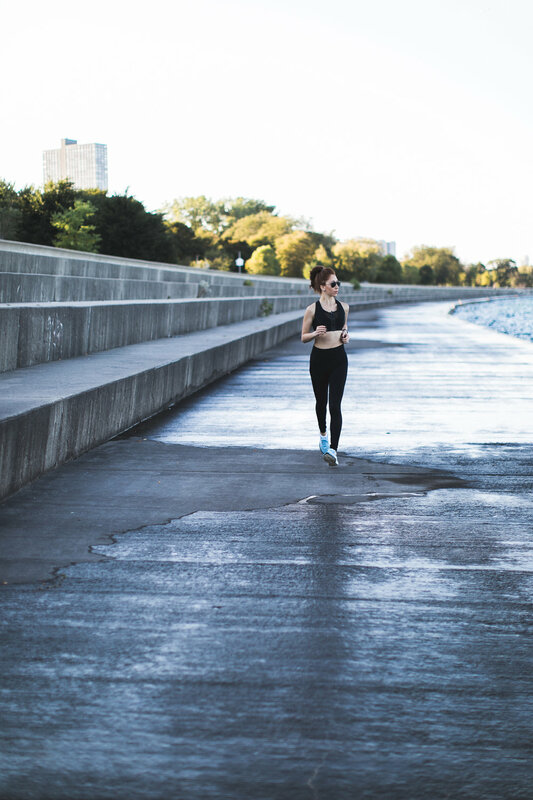 Download a training plan… Personally, I’ve always used the Nike+ Run App, it keeps you on track, adjusts as you progress through your training, connects you to community through the Nike Run Club, holds you accountable and keeps you on track, which can often be the hardest part. Regardless, be it an app or printed program, get on a running schedule, there’s a reason they’re out there. Cross Train… This is one of the most under-rated and overlooked aspects of marathon training, but it’s critical to your safety & success. Cross training will not only improve your performance on race day, but will protect you from injury. Make sure you’re working on your core, legs, and your entire posterior chain. The more muscles you engage during your runs, the easier your runs will become- train smarter, not harder. Also recommended: visit a running specialist and see what areas need work. Corrective exercises, might feel tedious, but if you’re not using the proper muscles or movement patterns, you literally won’t be capable of functioning at your full potential. Read more about Glute & Core exercises here. Recover… I encourage all of my clients to incorporate massage therapy into their training. Often times, they feel like it should be a treat that needs to be earned, but that’s where we get it wrong. Recovery, be it sleep, self-myofascial release (foam rolling), or massage therapy is a necessary luxury, and your body will respond accordingly. Personally, this week I’ll be seeing my chiropractor for one last adjustment, spending extra time on a foam roller, and if possible adding in a massage early in the week to work out any tight spots. Slow it down…. The week prior, begin to taper off. No need to show off or prove anything this week, you’ve trained for months, and now it’s maintenance mode. Keep moving, keep cross training, but nothing crazy. The last thing you want to do is stumble upon an injury or burn out in those final days. Reserve your energy for when it counts. Fuel up… ALL WEEK! Your nutrition this week is critical to setting you up for success. Stay well fueled & hydrated throughout the week. The idea of “carbo-loading” the night before is all wrong. Yes, you’ll need more carbs for race day, trust me, you’ll burn through your full storage supply, but rather than overloading the night before, begin incorporating more carbs into each of your meals this week. Think quality carbs, not fat, and remember it’s not about eating more, but about increasing the percentage of carbs in your daily caloric intake. Have some pasta the night before, but if you’ve done well fueling up throughout the week, there’s no need to eat the whole lasagna. 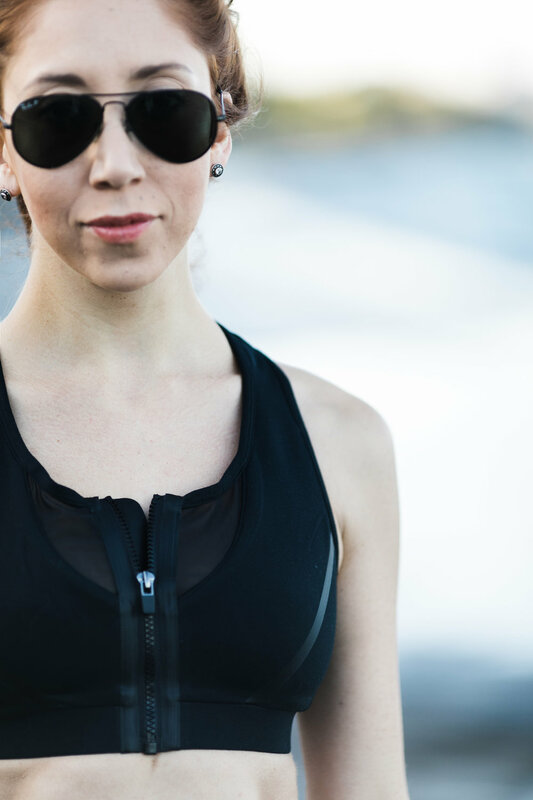 Dress the part… Race day temperatures can vary, so set aside a couple options just in case. Most importantly, make sure you’re running shoes are worn in. One of the biggest rookie mistakes you can make is running on a new pair of shoes- talk about blisters, ouch! Personally, I don’t pack water on race day (there’s plenty of water stops along the way), but I will have a waist band for energy gels/gummies. Often, these aren’t offered until later into the race, and you may need them a few miles before or after that option becomes available. Also, don’t be afraid to pull out the vaseline or anti-chaffing stick, there’s no shame in being cautious. Rise & shine… This is where you need to know your body, it’s going to be a long day, so you want to get started on the right foot. For some, this might mean waking up even earlier than most, some runners prefer to get a warm-up mile in before the race (that’s not me). Regardless, when it comes to breakfast, avoid runny food selections, no smoothies, yogurt, or eggs as they don’t tend to sit well. Oatmeal is my go-to race day breakfast, I might add some chia seeds, or peanut butter for added fuel. If you’re in a rush, try to grab a banana with peanut butter or protein bar. And fun fact, there are two Clif Bar flavors that offer an added boost of caffeine– look for Cool Mint & Toffee Crunch. After party… Completing a marathon is huge achievement, so make sure to plan a celebration for afterwards. For many, this might be as simple as ordering takeout and resting for the remainder of the day, but If you have friends or family coming to cheer you on, plan ahead and make dinner reservations early. Finally, have fun!… Remember this is a celebration! You’ve logged countless miles training for this, you’ve already won & believe it or not, today is the easy part! I don't know about you guys, but this week flew by! Also, it officially feels like Fall in Chicago, and I'm not loving it. Bring back summer! Would love to get your feedback and start looking at some event times this fall. Let me know what kind of workouts you'd be most interested in seeing, too! Ever see that person who works out super hard once a week, but doesn't return until next Monday? Maybe you've been that person and you're frustrated knowing the effort you give, while lacking to see results. One of the biggest questions I get, is "How often should I workout?" Let me start by emphasizing there's no magic formula. When clients come in for their first consultation, we don't workout, instead we chat through their goals, medical and exercise history, run through a series of movement tests, then jot down some measurements to measure their progress. Bottom line, each and every one of us is so unique that what works for one is not a guarantee for the other. That being said, two primary factors in any & all client success stories are water consumption and consistency. Consider the first a life-tip (we should all be drinking more water), but the second is your key to seeing results. Supercompensation is a term in sports science describing the process your body undergoes following a workout. Eery time you workout, you're essentially breaking down tissue, creating microscopic tears in your muscle fibers, (this is how you develop new muscle). 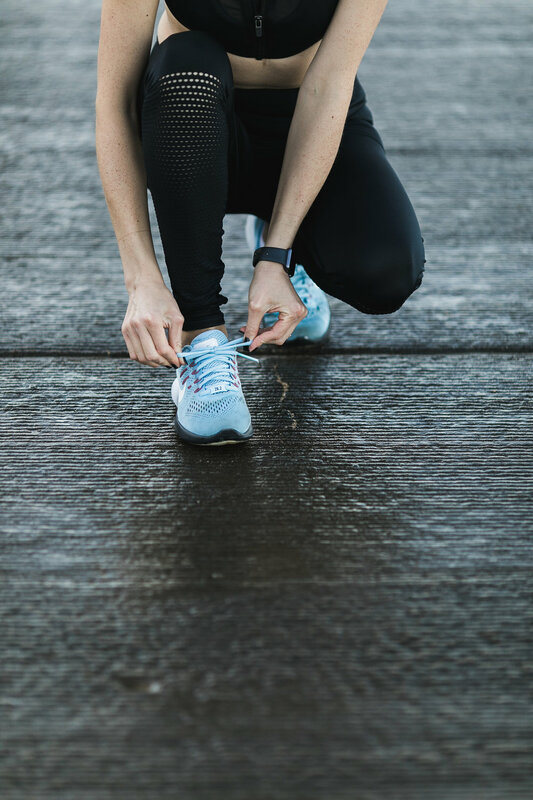 When we do this, we send our bodies into a bit of a shock– call this the "Oh Sh*t" moment, as your body quickly reacts by not only recovering back to your normal fitness level, but overcompensating in anticipation of whatever you have coming next. During this time (generally a 72hr window), you're body is prepared to perform at a higher capacity. The key is to catch your next workout, while your body is still in that overcompensating state, so as to build on what you did previously and develop that upward momentum towards your goals. Similarly, if you fail to catch your next workout within that 72hour window, your body's performance capacity will slowly drop back to your original baseline, making it difficult to see results, hence that person who only works out once or twice a week & is disappointed by their lack of progress. Have you found yourself in one of these two categories? While there's no magic formula to success, strength training 3x a week with added cardio on off days is a solid guide. Below is a graph I drew up to help demonstrate this process. Please feel free to reach out if you have any questions. I tend to geek-out over this, so while I don't want to overwhelm you, I'm more than happy to help!